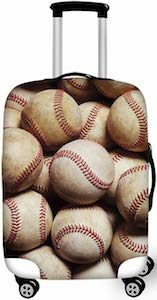 If you want your suitcase to keep undamaged and like to play ball then you should check out this Baseballs Suitcase Cover. The suitcase cover is available in 3 sizes to fit your suitcase perfectly. The cover is flexible to fit snugly around your luggage and by that it will protect your luggage and even prevent theft as it is a bit more difficult to quickly get into the suitcase.. The suitcase cover has a fun print of baseball balls and a whole lot of them and they are even a bit dirty like they get after a nice game. This entry was posted in Uncategorized and tagged baseball, suitcase cover. Bookmark the permalink.